Under the auspices of the Public Art Fund, Indian born, London resident artist Anish Kapoor is bringing one of his typically large creations to Brooklyn Bridge Park, as Artnet News reports. 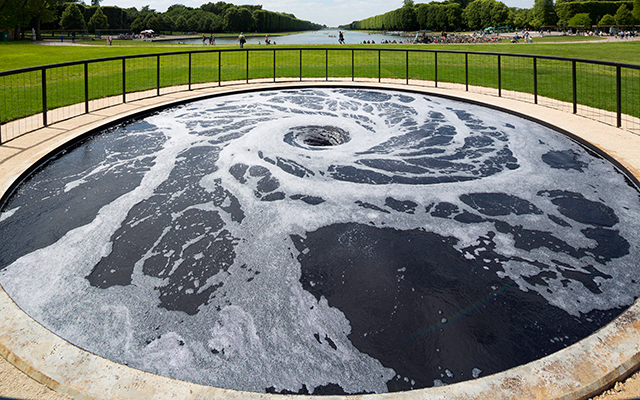 “Descension” (photo: anishkapoor.com) is twenty six feet in diameter and is described in the Artnet News piece as being “made by pairing an all-natural black dye with a continuously spiraling funnel of water to produce the illusion of an ever-churning black hole.” It will be on display from May 3 through September 10. The Public Art Fund’s press release, published on the Brooklyn Bridge Park website, gives Descension’s location as “Pier 1″ but nothing more specific. My guess is that it will be at the north end of the Bridge View Lawn, near the foot of Old Fulton Street, the same location that sported Jeppe Hein’s “Appearing Rooms” (scroll to bottom of linked post) two years ago. Looks interesting. It’s going to be a busy summer in the park. I saw this morning that the vista-blocking hotel/condo at Pier 1 is open now too. I find the idea more mysterious when it happens naturally (e.g. : http://www.atlasobscura.com/places/lost-lake). Although I happen to love his work, I count myself among those artists who are annoyed by his exclusive permission to use Vantablack (http://hyperallergic.com/279243/anish-kapoor-gets-exclusive-rights-to-the-worlds-darkest-pigment/), and simultaneously amused by the ensuing pigment war (https://www.dezeen.com/2016/12/30/anish-kapoor-uses-stuart-semple-worlds-pinkest-pink-despite-ban/). Afterwards I tweeted a picture of my middle finger dipped in turmeric to him with the claim that it was the most turmericy turmeric and that he wouldn’t be allowed to taste any. Nevertheless I look forward to seeing this installation. How long will it be before someone pours soap into this thing?